How is it that the small continent of Europe, with its rich multiplicity of cultures and traditions, has managed to exert so profound an influence on the rest of the world? Roberts's sweeping and entertaining history notes the paradoxical effect, for good and ill, on everything touched by those Western values that originated in Europe. 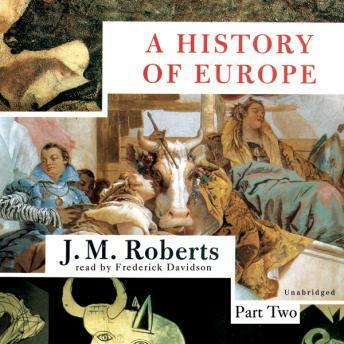 Beginning with its Paleolithic origins and the early civilizations of the Aegean, Roberts traces the development of the European identity over the course of thousands of years, ranging across empires and religions, economics, science, and the arts. Antiquity, the age of Christendom, the Middle Ages, early modern history, and the old European order are all surveyed in turn, with particular emphasis given to the turbulent twentieth century. not such a captivating listen. the pace is rushed in parts and drags to a standstill in others. narrator drones in a somewhat annoying voice.